San Jose State University's Alonzo Carter is taking social media by storm thanks to some sweet "Hammer Time" moves. 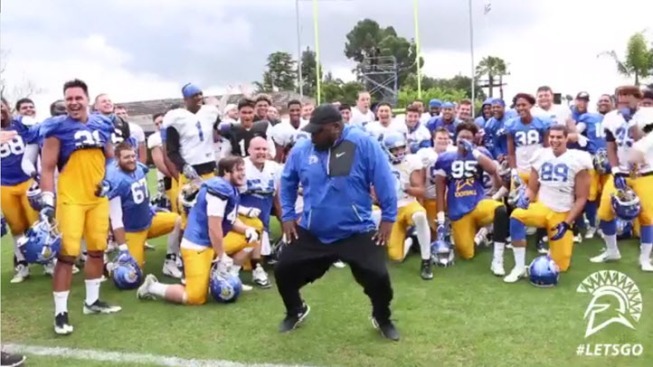 Video posted by San Jose State Football online shows Carter performing an MC Hammer dance routine to the 1990s smash hit "U Can't Touch This." Please Coach Carter, don't hurt 'em! It's no surprise Carter, a running backs coach for the university's football team, has the dance memorized like the Spartans playbook. He previously served as a backup dancer for MC Hammer, according to SJSU's The Spear.